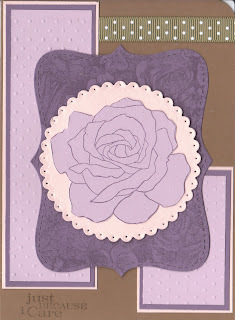 My card today is for yesterday's MMSC challenge. I knew when I looked at the sketch that I wanted to use my Top Note Die in the middle. I also knew that I was going to have to make a larger card in order to be able to see the panels to the side, so this card actually measures 4 3/4x 6 1/2. I also used yesterday's SCS color challenge of Perfect/Pale Plum and Soft Suede. I added a bit of Blush Blossom as well. I guess you could call that my "neutral of choice." I gotta tell ya though...not crazy about this color combo. Don't think it's one I'll mark down in my book to revisit. Everything is really straightforward, and I'm anxious to get started on my projects for today. Since the kids are on winter vacation this week, I am trying to get my stamping done in the morning so that we can do some fun "Mommy and me " things during the afternoon. What a beautiful rose and perfect design elements to accent the focal point. Great job on the sketch this week! Thank you for joining us again this week at the Midnight Madness Sketch Challenge. We love seeing your work and having you as part of our family. This image is so pretty!! One of my fave stamp sets. Love your color choice. Fab job with the sketch this week, thanks for playing along with Midnight Madness.